North Korean Foreign Minister Ri Su-yong reportedly spent more than a week in Switzerland without any official schedule on his return from a tour of the Middle East and Africa. Ri had visited Ethiopia, South Africa, Kuwait and Qatar after leaving Pyongyang on May 24. He arrived in Switzerland on June 20 and stayed there for more than a week, a diplomatic source in Seoul said Tuesday. 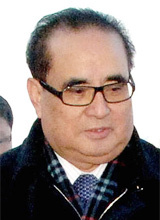 The source pointed out that Ri is a former ambassador to Switzerland, where he managed former leader Kim Jong-il's slush fund and served as a guardian for Kim Jong-un. No North Korean media reported on his visit to Switzerland, giving rise to speculation that he was busy sorting out Kim Jong-un's numbered accounts.